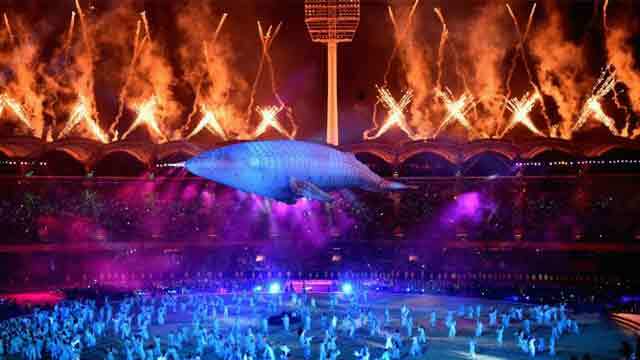 Sydney, Apr 4 (Just News): The 21st Commonwealth Games are officially under way after a spectacular opening ceremony on the Gold Coast. A heavy downpour of rain greeted the start of proceedings but that failed to dampen spirits. The crowd and athletes were then treated to a ceremony showcasing music and dance drawing on Australia's history and traditions. However, there were protests outside the stadium by indigenous rights activists who earlier disrupted the Queen's baton relay as it made its way to the stadium. The first gold medal of the Games will be awarded in women's triathlon on Thursday. After the delegations were led out in Glasgow four years ago by Scottie dogs, this time they were led by a 'Nipper' - a young Australian surf lifesaver aged between 5 and 14 years old - while members of Surf Life Saving Queensland marshalled the teams around the stadium. Scotland - the first team out into the stadium - were led by athlete Eilidh Doyle, while triathlete Alistair Brownlee, who will be defending his men's title on Thursday, was at the head of the English team. Swimmer Jazz Carlin and netballer Caroline O'Hanlon carried the flags for Wales and Northern Ireland respectively. However, the biggest cheer of the night was reserved for the record 473-strong Australian team, headed by hockey player Mark Knowles. In Glasgow, England dislodged Australia from the top of the medal table for the first time since 1986 - winning nine more golds - but Australia are keen to regain top spot on home soil. The athletes were welcomed to the Gold Coast by Commonwealth Games chairman Peter Beattie and president of the Commonwealth Games Federation Louise Martin with Australian lawn bowler Karen Murphy, coach of the Australia netball team Lisa Alexander and technical official Des Johnston taking the Games oath on behalf of the athletes, coaches and officials. After the baton made its way around the stadium via some iconic Australian sportspeople, including hurdler Sally Pearson, it was presented to the Prince of Wales. "The ancient stories of the Aboriginals remind us that even though we are half a world away, we are connected and the Games shows the potential to connect," she said. "I continue to be inspired by all those taking part and I send my warm wishes to every individual and team."